Setup New handoff features now publicly available on Yosemite. 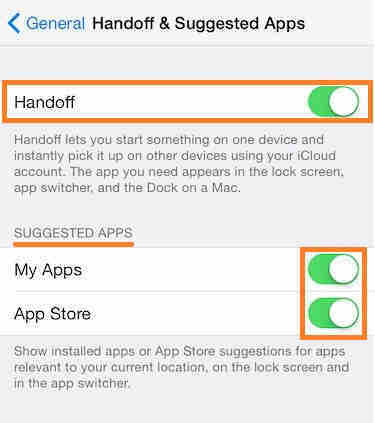 As well as iOS 8 and later version will only support handoff on iPhone and iPad. Now, Apple is giving option to call, Share your task – Work in-between from your Mac (Yosemite OS X installed) to iOS 8 (iPhone and iPad) device and iOS 8 to Mac as well. So don’t miss out these features to use in your Mac Yosemite and iOS 8 like, handoff can call from Mac to iOS device vice versa, Share you current work from Mac to iOS device, With some Hendy pre-requirements given in this tutorial – Setup and use Handoff on Mac Yosemite and iOS 8. Mac running on Latest version on OS X Yosemite (OS X 10.10) (Note: Download, install or update Mac OS X Yosemite in your Compatible Mac device). iPhone and iPad installed with iOS 8 device (iPhone 4S, 5, 5C, 5S and iPad: iPad 3 or above) support handoff. Keep Distance between both devices that running handoff should be near as possible. Before proceed for setup first check you have updated OS X from Mac configuration. You have Yosemite OS X good luck and follow the below step. Also logged in your iCloud account (System preference > iCloud) with same ID used iniOS device. 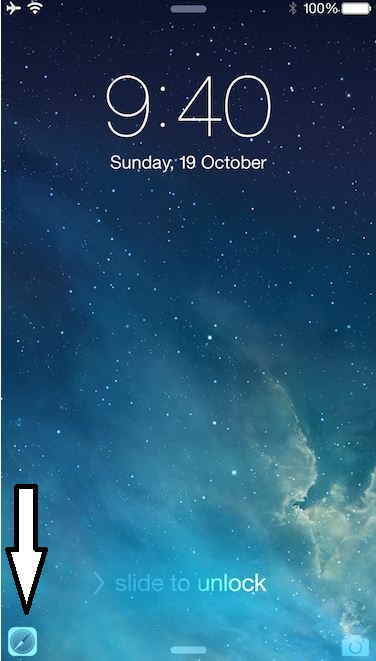 Make you Mac for handoff notification. Now you have successfully setup handoff on Mac OS X Yosemite device. Turn On Bluetooth and Wi-Fi on your iPhone/ iPad. Enable handoff, Go to the Setting > General > enable Handoff. Go to the setting > iCloud and login it. 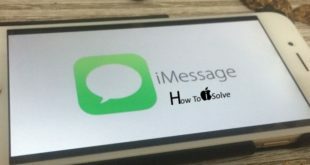 Call and Text: You can call your device from Mac to iPhone/ iPad. At that time notification comes for answer the call for limited range. Continue work from other device: you can transfer your work from Mac to iPhone/ iPad. For Ex, if you are searching from safari on Mac than you have to search same item on iPhone/ iPad, just open iPhone/ iPad lock screen. 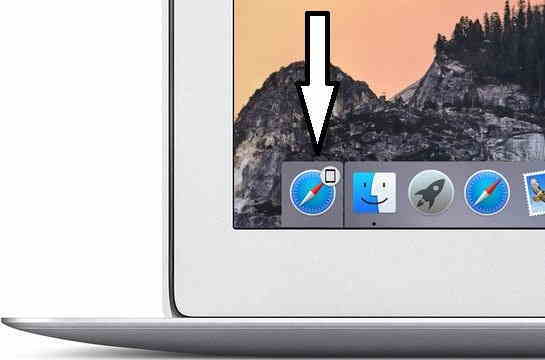 Safari icon will automatically appear at bottom of iPhone/ iPad screen. Tap on it, safari launch automatically with same searched on Mac. So in iPhone/ iPad, you can do continuously job without re-typing URL and more. Apps works on handoff: you can do same with handoff supporting apps like Mail, Maps, Messages, Reminders, Calendar, Contacts, Pages and Keynote. 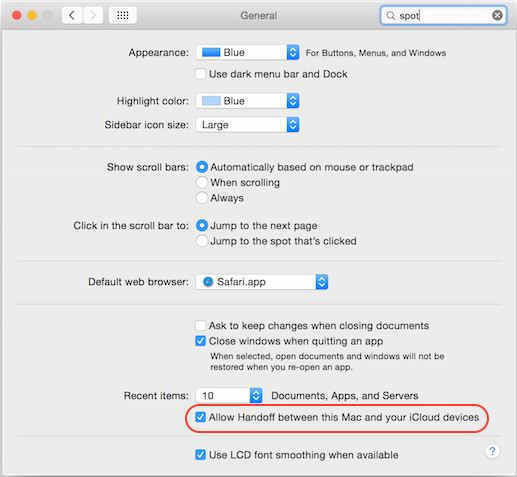 You learn how to setup and use Handoff on Mac Yosemite and iOS 8 iPhone and iPad. Mac Yosemite tip: How to decrease/ Reduce transparency in OS X Yosemite. Don’t miss out how like this new feature after setup and use Handoff on Mac Yosemite and iOS 8, and what’s your favorite features inside handoff, toady where are you using and which app’s handoff feature likes you most in below community’s comment box?